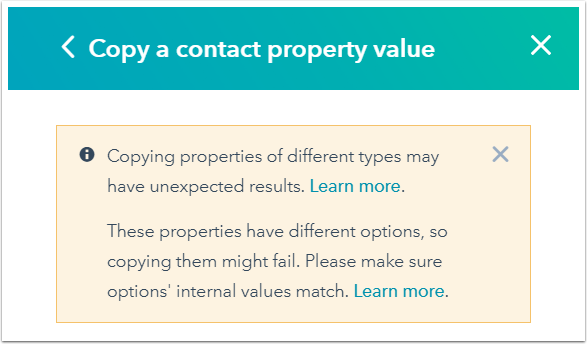 When you add an action to copy a property value in a workflow, only source and target properties with compatible property field types can be selected. Read-only properties cannot be selected as target properties. * When enumeration property values are copied to text property values, the internal value for the enumeration property will be copied. Date picker properties: can store information at the date level. For example, a date picker property value is January 1, 2019 (date). Datetime properties: can store information at the date and time level. For example, a datetime property value is January 1, 2019 (date) at 5:04:13 PM (time). All of HubSpot's default date properties (e.g., Create date, Last modified date) are datetime properties, while all custom date picker properties are date picker properties. It is only possible to create or update datetime properties via the HubSpot API. In order to copy a date property value to another date property, the two date property types must match, or the source property must be a date picker property and the target property must be a datetime property. It is not possible to copy datetime property values to date picker properties, because the date picker properties can't store the timestamp. When you copy enumeration property values to other enumeration properties, the property options of the source enumeration property must have internal values that match those of the property options in the target enumeration property. For example, if the source enumeration property has four options with internal values A, B, C, D, the target enumeration property must have the same four options with internal values A, B, C, D.
If you select source and target enumeration properties that have property options with mismatched internal values, a warning message will display. To resolve this warning, edit the source and/or target enumeration properties to have property options with matching internal values. If the source and target enumeration properties have property options with mismatched internal values and the action is added to the workflow, it will fail when an enrolled object has a source enumeration property with a property option with an internal value that doesn't match one in the target enumeration property. Read-only properties (e.g., Create date, Original source) are set by HubSpot analytics or third-party integrations and cannot be selected as target properties as they cannot be edited.